The opening of the 2013/14 theatre season at the Playhouse was bright, colourful and bursting with joy. 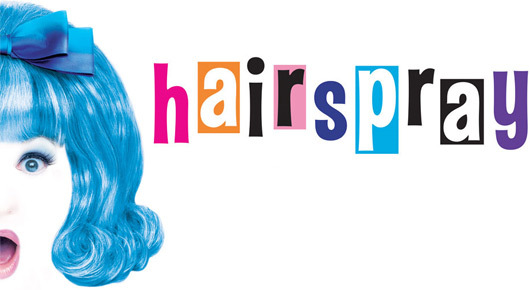 Having seen the film of Hairspray (which I wasn’t overly impressed with) I wasn’t certain whether I’d like the show. I was pleasantly surprised. The film comes over as brash and silly, but on stage, the bold strokes in which this story is painted are just enough to get over a very real and important point about social acceptance while still allowing the audience to have a whole lot of fun. The basic plot takes place in 1962 and follows the rather “larger than average” Tracy Turnblad who has ambitions to dance on The Corney Collins Show on TV. While planning how to manage it, she meets some of the black kids in her school and begins to question the racial segregation which is considered normal. Comic capers ensue, and a happy ending is had by all. It’s a little bit like someone smushed together Show Boat, Grease and the great British Pantomime tradition (complete with the Dame in the form of Edna Turnblad) and then topped it a little bit of Sixties technicolour. Despite this strange combination, the story works. It’s not too silly, it’s not too brash, it’s not too moralising – it’s just right. The musical numbers are a standout highlight of this show and one of the reasons for it’s success. Shaiman and Whittman write fantastic songs which manage to pastiche many great 60s hits while still allowing the music to be fresh, innovative and unique. It doesn’t surprise me at all that they were invited to write the music for Bombshell, the fictional musical in the US TV Show Smash. My final note is that although there’s an “everyone get up and dance” moment at the end of the show, this is very clearly after the curtain call. This small detail made me very pleased because it allows the audience to choose whether to give a standing ovation, rather than being forced into one. It’s my petpeeve to attend shows where I am not given that theatre-goers’ right not to give a standing ovation. However, this production pitched their ending beautifully, allowing me to remain seated during the curtain call, and then stand to join in with the dance break. Surprisingly, the opening night in Edinburgh of this tour featured not one, not two, but six replacement cast members, including the understudies for both Tracy (Nikki Pocklington) and Edna Turnblad (Daniel Stockton). In fact, my ticket-broker-come-musical-theatre-encyclopedia companion took most of the interval to work out how there could be six replacements on stage, but only five swings in the cast (the answer being that Tracy’s understudy is a “walking understudy” meaning she has no other role in the production due to the requirements for the actress to be large – you learn something new every day!). Of course, most of the audience would have no idea, and it certainly didn’t show that this had been the debut performance in their role for several of the actors. The highlight performance of the evening was, for me, Lauren Hood as Penny Pingleton. Penny is a geeky and awkward character which would be easy to overact, but Ms Hood’s performance was spot on. Paul Rider was also a gorgeously entertaining Wilbur Turnblad opposite the understudy for Edna, Mark Hilton. The weakest performance of the night, sadly but expectedly, was Lucy Benjamin. Although her acting of the part was lovely, and her physicality was good, her singing was rarely singing – very raspy, breathy and strained. There were some technical issues which also detracted from the largely excellent performances. The balance of the sound was often poor, making it difficult to hear the words to the songs. There was also one glaring costume problem – Edna’s finale dress was clearly intended to be pink (to match Tracy and Wilbur’s costumes), but instead it was a strange, clashing shade of red. I sincerely hope that this was due to costume damage, and not a directorial choice! This is a lovely, upbeat musical best seen at the theatre rather than on film. It’ll definitely be appealing for teenage girls as well as adults, making it a good family choice. The lively music will be ringing in your ears long after you leave the theatre, and the moral of the story, about being true to what you believe is right, is one everyone could use a reminder of now and then. This entry was posted in Musicals, Reviews and tagged 4 stars, musicals, playhouse, reviews on 4th September 2013 by .